Happy hump day dear friends! Hope you're all looking forward to Friday as much as I am. Is it just me or does it feel like this week has been dragging on forever. So what better way to spruce up a Wednesday than a little bit of glitter! In continuation of my Sally Hansen spring release press samples I have today, Sally Hansen Complete Manicure in Open Mica Night and Glare Necessities. 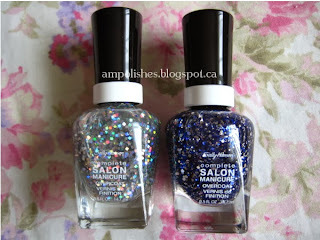 I paired both glitters over the Insta-Dri polishes reviewed yesterday. 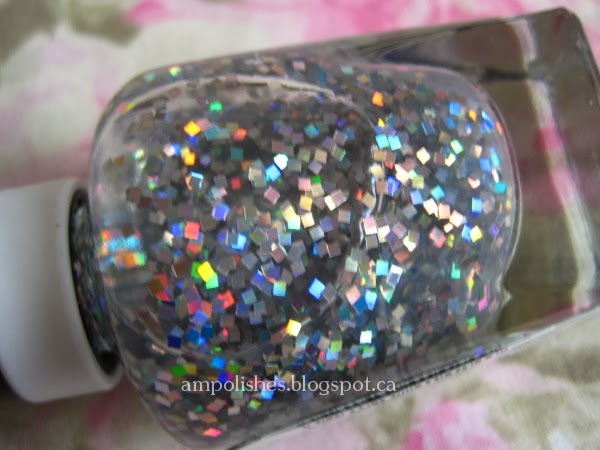 Open Mica Night is a holographic square glitter in a clear base. I used two layers over Sally Hansen Insta Dri Chartreuse Chase in my swatches below. I had to work a little bit and pat the polish to distribute the glitter evenly over my nails. Glare Necessities is a blue and silver glitter in small and large sized hex glitter. 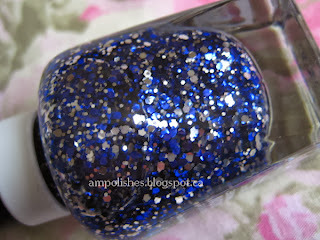 In some lighting the blue glitter appears much darker, almost black. I layered two layers over Sally Hansen Insta Dri In Prompt Blue. 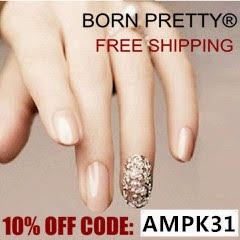 I really liked the glitter payout of the polish, I didn't get bald spots and didn't have to pat the glitter into place. Each polish is 0.5 fl oz / 14.7 ml in size and priced around $7.95 MSRP and will be available in most drugs stores across Canada. Two more days until the weekend, woohoo!